FCE Scan® About us. What is FCE Scan and how can it help you. 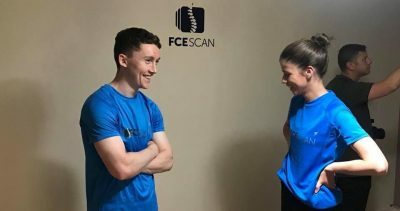 FCE Scan® is an Irish company using state of the art and cutting edge injury detection technology. FCE Scan stands for Formetric Clinical Evaluation, this means the whole body (form) is scanned and assessed in a clinical setting and is measured (metric) for its position, weightbearing and movement. FCE Scan uses a technology that has over 390 studies and publications behind it. Our system is a registered medical device having reached MDD (European) and FDA (U.S) standards. The technology is used worldwide in Orthopedic hospitals, Private Clinics and also in Elite Sports facilities. FCE Scan was established by Eoin & Conor Flynn registered health professionals with decades of experience. They have a vision for the physical healthcare assessment and treatment models of the future. The FCE Scan system is a cutting edge and specialist device to help speed up and/or correct injury diagnosis through motion analysis. Furthermore, the aim of the system is also to quantify if treatment is working and to prevent injury recurrence. What are the qualifications of FCE Scans Formetric team? We have access to a worldwide diagnostics team. This team includes Orthopaedists, Osteopathic Physicians, Osteopaths, Physiotherapists, Sports Scientists, Occupational therapists, Bio-mechanists and Podiatrists to name but a few. Any of these professionals may be performing the scans on a given day and they are all highly trained in the function of our system. Eoin Flynn D.O. B.Sc. (Hons) Osteo. Conor Flynn D.O. B.Sc. (Hons) Osteo. Shane Hassett B.Sc. M.Sc. Sports Science. Olwen Kennedy B.Sc. M.Sc. Occupational Therapy. What services do FCE Scan provide? A full list of our individualised services and their prices are available under our pricing tab. FCE Scan provides state of the art methods of Back, Spine, Pelvis, Leg and Foot analysis. We also provide Sports Performance analysis and Scoliosis screening. No referral is necessary. The highly qualified members of our diagnostics team perform and interpret all scans. Our clinical assessment centre is dedicated to finding the cause of your injury or Back pain. We provide a full, detailed and easily understandable report to each client. On leaving our centre each client knows what is wrong with them, why it has happened and how to resolve it. This approach to injury is our Scan and Plan™ initiative (have the scan, then plan the correct treatment). On arriving in our clinical assessment centre the client fills out a short questionnaire. To perform the scans a patient will have to reveal their spine. We supply gowns for female patients and also for male patients if they so wish. The gowns retain modesty at all times so that the client feels comfortable and relaxed. We also advise bringing a pair of shorts with you for accurate analysis of the pelvis, hips, legs and feet. The scan itself is performed in a darkened room, the patient will see a light grid appear behind them and also an infra red light. The static scan will take about 15 seconds. 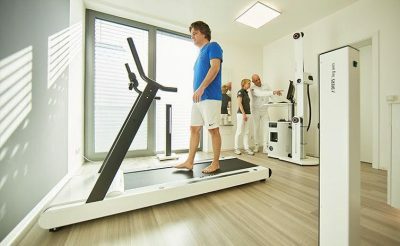 The motion scan differs only by the fact that the patient will be walking on a specialised treadmill for 30 seconds. Scan results are available immediately. The client will receive a printed report, they will fully understand what there injury is and what is causing it. Furthermore, as part of the Scan and Plan initiative, the client will also have a FREE specific and tailored care plan to very quickly get them on the road to recovery. I have the FCE Scan done, what then? Once our scans have been performed we advise you on a course of action. Our scans provide evidence based assessment which in turn lead to evidence based therapy. This leads to much better outcomes. We provide a care plan of our own that entails exercises and advice on how to correct the issues we find. This care plan is free of charge, we call it Scan and Plan. We also have a directory of professionals we can refer you to when we feel therapy is needed, or where you yourself would prefer it. Furthermore, when currently seeing a professional, we encourage you to discuss our scan results with them. What is Scan and Plan? Our Scan and Plan™ initiative was born around our vision of physical healthcare. The first point of any pain or injury assessment should be the Scan, this way the client and therapist know exactly what is wrong, why it is wrong and so can implement the tailored treatment Plan to correct it. In the majority of cases we also offer the therapy plan FREE of charge. This saves the client both time and money. The printed report creates an invaluable level of objective data and testing for the clients therapist. Thus allowing the therapist to administer the correct treatment. It is also aimed at reducing the load on outpatient waiting lists. What is the difference between FCE Scan and MRI's or X-Ray? FCE Scan is a motion analysis scan. It is radiation and magnetism free. We scan the spine, pelvis, legs and feet both statically and in motion to find the root cause of an injury. Our scans use Photogrammetry and Triangulation to assess strain patterns occurring in the body. MRI scans can look internally across one area of the body and are performed lying down. X-ray is similar to MRI as in it is a cross section of the spine in one position. I'm seeing a Physio, can FCE Scan help? Certainly. The level of detail we provide on any injury is unmatched. We provide objective results for a professional, thus removing any inaccurate subjective assessment. This allows for greater evidence based assessment and treatment. Therapists want to get clients better, with our scans they can really tailor a treatment plan. Therefore, treatment after one of our scans is extremely successful and much quicker. We also provide our own care plan to clients FREE of charge. Having a female member of our Formetric team performing the scan is no problem. We can only guarantee this by booking with us over the phone. Our online booking system is currently unable to facilitate any preferences.